History: As one of LA's top flight engineer/mixers, Mark began his recording career while in college when he started his own PA company. While running the company, he began working with artists such as Seals & Crofts, Sha Na Na, and Livingston Taylor. 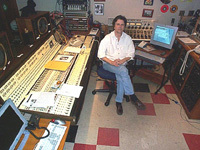 Two years later, Mark began working in Hollywood for Artist Recording Studio. “It was a pretty funky old place,” he said, “at 6 PM every night the local AM radio transmitters switched patterns and began interfering with the recording equipment.” Yet he remembers being happy about the recording freedom he otherwise enjoyed there. For a brief period Mark worked for Paramount and then Mystic studios. But in 1973 he moved to New York and began working as a staff engineer in Manhattan. He then enrolled at Boston University as a communications major, moved to Boston and volunteered at the school’s 50,000 watt NPR station. While living in Boston, he met a Hanley Sound rep. who knew Frank Zappa’s crew. When Zappa’s soundman became sick before the first tour date in Hartford, Connecticut, Mark recieved a phone call. It was Zappa’s band, who wanted him to fill in. He single-handedly, mixed the concert from their 48-channel board. From that success he ended up working with Zappa’s band for the next two years. In 1976, Mark worked for Earth, Wind & Fire’s 8-month tour. During that time he met George Massenberg and was offered a job as second engineer at Sunset Sound, which he accepted. He worked at Sunset for two years before striking out on his own to become an independent engineer in 1979. Mark went to work for Amigo (Warner Bros.) under Lee Herschberg. While at Amigo, he worked with Randy Newman, Rickie Lee Jones, Los Lobos and Michael McDonald. He remained at Amigo until 1984 when Warner Bros. shut the studio down. Mark returned to his independent status full-time in 1984. One of his long-term projects included working with Brian Wilson on his solo LPs, Beach Boys compact disk reissues for Capitol Records, and “The Pet Sounds Sessions” boxset which earned him a Grammy nomination in 1998. When he moved to his current residence in Southern California nine years ago he was looking for a house to accommodate a small studio. Today Mark's home studio offers a customized API console with 36 inputs and flying faders, an airpack remote system, and a 14 input UA console, built in 1962 (originally installed in historical Western Studio #2). Ninety percent of Mark's work is now done at his home studio. " The home studio (a 20 x 15 room) allows me to develop individual techniques, experimenting with room mics and sounds," says Linett. Mark mixed a live recording of Brian Wilson performing the songs from Pet Sounds at the Royal Festival Hall in London, released in June 2002 by Sanctuary Records. Mark is working on the Beach Boys' albums Pet Sounds and Surf's Up, mixing them to 5.1 surround at 96 kHz sampling for DVD-Audio release by Capitol. The Pet Sounds DVD-A, scheduled for release in early 2003, has some bonus cuts, including an instrumental, "Summer Means New Love," which originally appeared on the Beach Boys' previous release, Summer Days (And Summer Nights!!) and is very much a precursor to the way of working that the band adopted for Pet Sounds. Current Credits: Mark received Grammy nomination for best engineered album which he recorded and mixed for Brian Wilson who won his first solo Grammy in 2005 for "Best Rock Instrumental Performance" for "Mrs. O'Leary's Cow" from his best-selling SMiLE album. Mark has completed 5 remote recordings in 2002 to-date with his location recording services dubbed “Your Place or Mine.” Most recently Mark worked on Dave Alvin's "Public Domain" which won a Grammy in 2001. Also Mark completed two live albums for Dave in 2002 "Out in California" and its compnaion "Outtakes in Ca" both of which he engineered and co-prouced. Mark co-produced and engineered the live Blasters reunion CD "Troule Bound." Additional artists Mark has worked with recently include Los Straitjackets (co-produced 2 and engineered 4 CDs) Red Meat, Christy McWilson, Big Sandy & the Flyright Boys and John Lithgow. 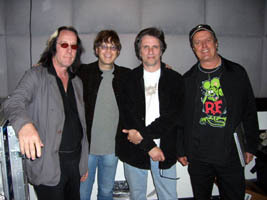 l-r: Todd Rundgren and Elliot Easton (New Cars), Mark Linett and Prairie Prince (New Cars). Over the course of a career, Mark Linett has worked closely with such seminal artists as The Red Hot Chili Peppers, Paul Simon, Brian Wilson, Love, and, most recently, the New Cars. Linett and the New Cars - Elliot Easton and Greg Hawkes from the original band in addition to Todd Rundgren, drummer Prairie Prince and singer/bassist Kasim Sulton - set up shop at Sound Stage in Burbank, California for three days of rehearsal in front of an invite-only live audience in January. "They are going out on tour so we did a live recording to hear how things were coming together, as well as to record a live album," Linett explains. In addition to the New Cars gigs, Linett has recently used his API flavored system on remote dates for the Isley Brothers, Hawthorne Heights, Nada Surf and a bunch of Brian Wilson projects that include the "Live At The Roxy Theatre" album, the "Pet Sounds Live" DVD and CD and the "SMiLE" DVD and CD. He also mixed Wilson's "SMiLE," "Gettin' In Over My Head" and "What I Really Want For Christmas," the singer's most recent Christmas album, at his some studio.